Sports are often used as models for real life. Since we frequently derive useful lessons from sports, these competitive challenges can serve as a microcosm for actual experiences - e.g. the importance of momentum within small teams is beautifully and repeatedly illustrated in basketball. Sports such as football, baseball, and even golf are the usual sources for the inspiration of these analogies. Although not commonly analyzed, I believe that tennis also has many valuable lessons to offer. Tennis is a major global spor t, but its popularity fluctuates wildly in the United States. Tennis in the U.S. usually gains limited prominence during particular times of the year when important and/or local tournaments occur. It also reaches widespread appeal when a particular U.S. tennis-star achieves a certain degree of success. Thus tennis doesn't usually come to mind as the prime candidate for useful illustrations of real world examples. 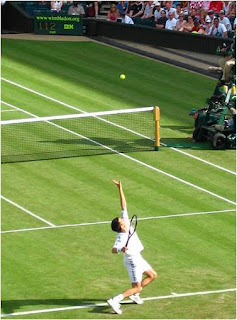 But tennis offers a very valuable venue for building arguments because, unlike any other sport, it mimics a particular real world scenario - it presents a simple model to describe and analyze the solitary competitor. This protagonist is completely alone, where communication with the coach (or caddy) isn't allowed. This hero faces one significant challenge at a time - the live and ever-changing opponent of the day. Such a scenario is often seen in business and social life. For instance, the solitary salesman often faces a very similar endeavor - tackling one potential sale at a time while alone in the field. Other such circumstances might occur in the line of duty for police officers, soldiers, consultants, spies, etc. Thus the explanatory power of tennis is both relevant and important. Tomorrow I will describe a few simple but valuable lessons that can be quickly learned from the game of tennis.